Over the past 150 years, our nation has made important investments in Canadian infrastructure, such as the national railway and the Trans-Canada Highway. We continue to make these transformative investments in our communities, in our country, and in our future. Work is currently underway in many communities across Canada to rebuild our infrastructure and find innovative ideas to tackle social, environmental and urban mobility challenges. As we look forward to celebrating Canada's 150 anniversary, we want to highlight some of the projects that will be completed in communities across Canada in 2017. We look forward to hearing from you about infrastructure projects in your community. Be part of the conversation. Please use @INFC_eng or @INFC_fra on Twitter and #Canada150. 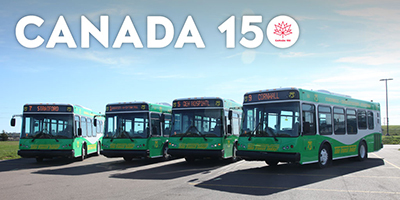 More than 150 years after the Fathers of Confederation came to Charlottetown by boat, transportation is much more accessible thanks to modern public transit. The public transit fleet in the Charlottetown, Cornwall and Stratford includes buses that are designed to look like old-fashioned trollies with wooden benches. Public transit ridership in the area has been increasing and accessibility measures were needed to accommodate all commuters. Thanks to a recent investment from the Government of Canada, and the Government of Prince Edward Island; T3 Transit, has received ten refurbished buses that were purchased from the City of Calgary. Commuters will now benefit from a larger, modernized public transit fleet. Not only will the additional buses accommodate increasing public transit ridership, but they are also wheelchair accessible and have features that will create a better overall experience for public transit users. The buses include free Wi-Fi, security cameras, Automatic Vehicle Location software (AVL), bike racks, have kneeling and ramp extension capability, and are equipped with exterior destination signs. The additional buses will be integrated into the current traditional fleet, and be able to provide efficient service for years to come. 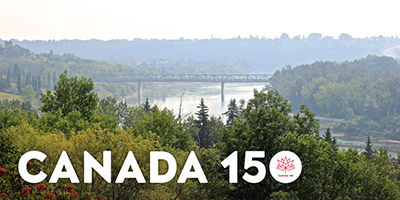 Nature trails, beautiful parks and recreational activities draw several residents and visitors to enjoy the North Saskatchewan River Valley in Alberta. This area, known as the Capital Region River Valley Park, is North America’s longest metropolitan park system. Work is currently being done to upgrade trails and infrastructure to ensure that the river valley is accessible year-round for people to connect to nature and enjoy what this region has to offer. The project will result in approximately 74 km of new and upgraded trails that will connect communities in the valley. It also involves the development of docks and a pedestrian bridge that will help create new access points along the river valley. The Government of Canada, in partnership with the Government of Alberta and the River Valley Alliance, is investing in this project. The work will not only help stimulate economic growth and bring social benefits for both residents and visitors, but it will also help protect the environment along the river valley. Canada is home to some of the world’s fastest and strongest rugby players. On the national and international level, our men and women’s teams continue to impress us, but here at home they are in need of a larger training facility. The Canadian Rugby Centre of Excellence – High Performance Training Centre in Langford, B.C. will be a 20,500 square foot facility for elite Canadian athletes to train and develop for the Olympics and other international competitions. 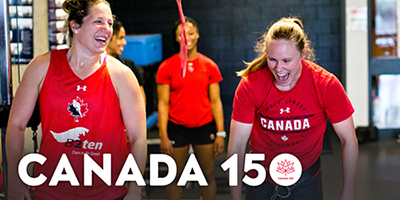 It will provide a daily training environment for the Canadian men and women’s national rugby teams. The Centre will also be open to the general public, offer recreational activities, and support the training of talented amateur rugby players. The construction of the Centre began in August 2016 and it will include a high performance weight room and gymnasium, recovery room, medical suite, analysis suite, team meeting room, players’ lounge, study room, locker rooms, recovery area, dining room, storage, office space, reception, and residential bedrooms that can be used by visiting athletes. It is expected to open in September 2017. The Government of Canada is investing in this project in partnership with the City of Langford and Rugby Canada. 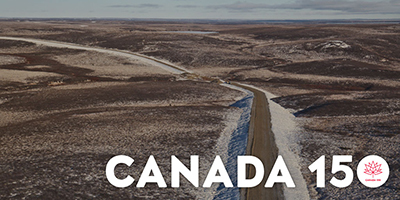 The historic Inuvik Tuktoyaktuk highway will be the first all-weather roadway to connect Canada’s coasts to the Arctic Ocean. The project will ensure connectivity between Northern communities and facilitate the movement of goods and people. It will also see that a year-round roadway is built for the Northern community of Tuktoyaktuk, which is currently served by an ice road, barge or by air. The Government of Canada, in partnership with Government of the Northwest Territories, the Hamlet of Tuktoyaktuk, and the Town of Inuvik, is supporting this project which will open the door to future growth and prosperity, and improve the quality of life for residents today and for generations to come. The construction of the highway has already created significant employment and training opportunities in the area as two thirds of the workforce are from Inuvik and other communities in the region. Research undertaken for this project will also greatly contribute to planning future transportation infrastructure in the North.